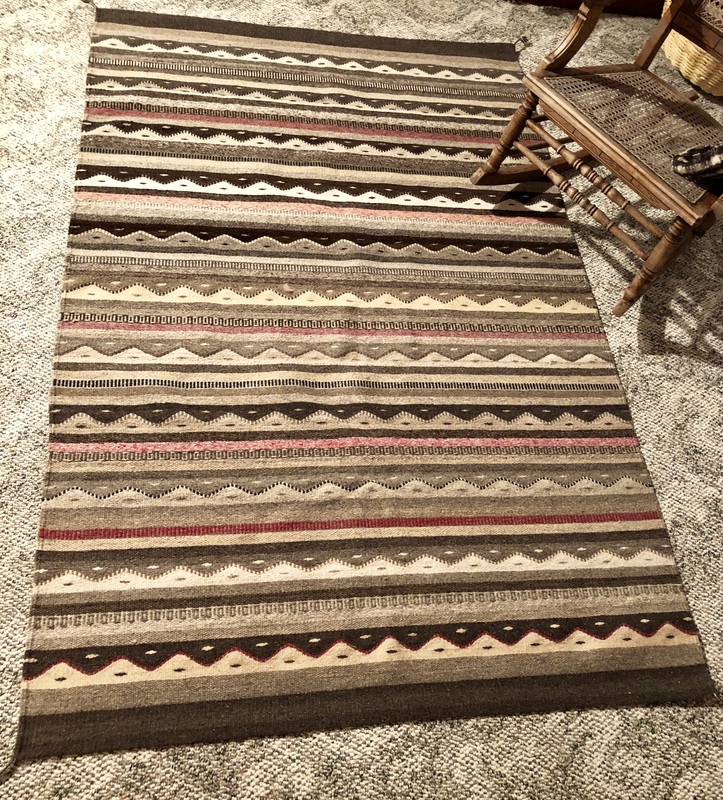 This afternoon Federico Chavez Sosa completed this extraordinary handwoven 100% wool rug created with natural dyes and cut it from his loom. It is a complex design that requires special skill to execute the curves and circles to perfection. The piece measures 32″ x 57″ and is $500 USD. Dyes are from the cochineal bug, pomegranates, wild marigold and the natural color of sheep wool. 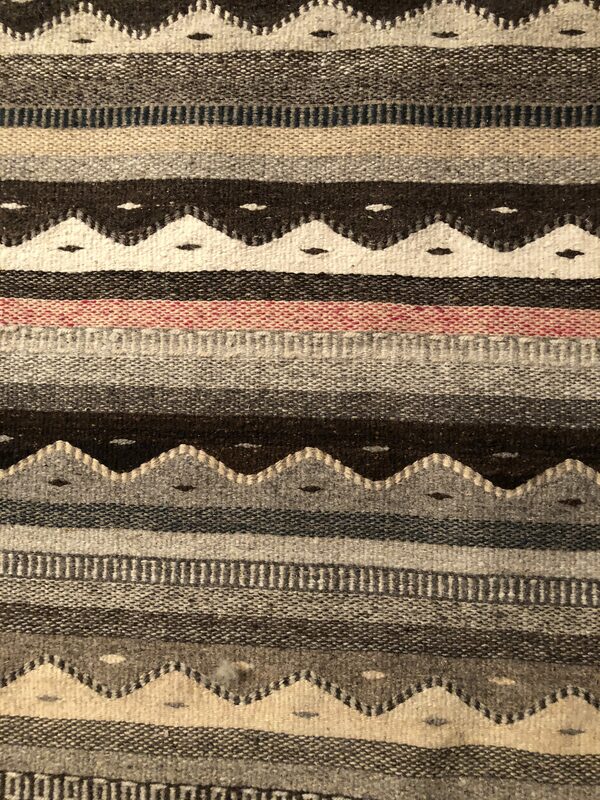 Federico is a master weaver from the Zapotec village of Teotitlan del Valle, Oaxaca. Since I am in Teotitlan now, I would be glad to bring it back for you and ship it from North Carolina after August 1. We can arrange payment with PayPal. The sound of familiar music drew me to the doors of the village church and another celebration. I took my seat at the back of the church as the service was coming to a close. The band led the way, playing full throttle. Behind them came the family — father holding a little girl about one year old dressed in white, a huge smile on his face, his wife next to him was beaming, beautifully dressed in a gauzy pink floral dress and gold jewelry. The rest of the family trailed behind them. As they approached, I smiled and said, felicidades. He stopped, asked me where I was from. Carolina del Norte, I replied. Oh, my brother worked in Raleigh for a while. Why don’t you join us at the party, just follow us to our home. I thanked them, and expressed my regrets. I had a massage appointment with Annie that I couldn’t miss. But, I was astounded at the generosity of the invitation, and reminded myself that this is what Teotitlan life is about — generosity and inclusion. I joined the procession as it curled for a block or two along with abuelos wrapped in tradition jaspe-style woven shawls, tias from Tehuantepec bedecked in gold and high heels, and then peeled off. First, a stop at the pasteleria to order my New Year’s Eve birthday cake, an all chocolate affair that would feed 20. Then, I noticed the chocolate cake topped with flan double layer extravaganza and ordered one of those, too. Federico was in the rug market today and I thought I would join him for a few minutes before heading off to Annie’s up the hill. 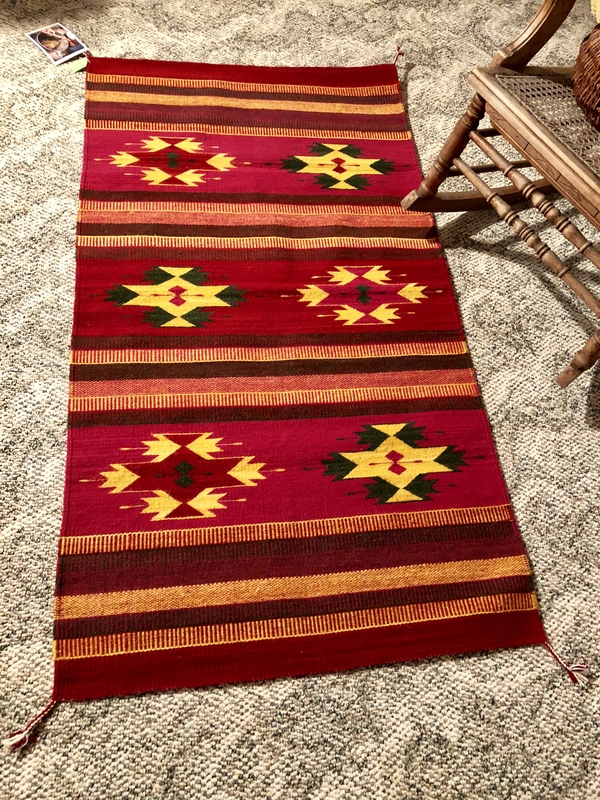 The Chavez Santiago family displays and sells at the rug market intermittently depending upon whether there is a celebration, trip to Oaxaca, or a commission to finish that might take priority. Today the market was filled with tourists, and as a gringa sitting in the stall with a Zapotec weaver, I guess I was somewhat of an anomaly. 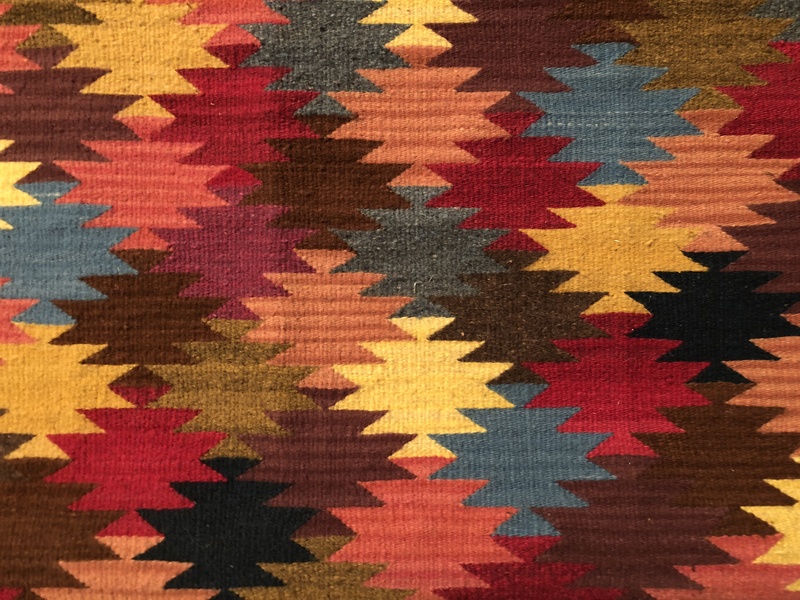 The English-speakers asked me where I was from, and from there it was easy to start the conversation about rug quality, natural dyes, cultural preservation, Spanish conquest history, and conserving authentic weaving and dyeing traditions. I met a bi-lingual man from Texas who brings his children to Mexico to teach them about their cultural history and traditions. 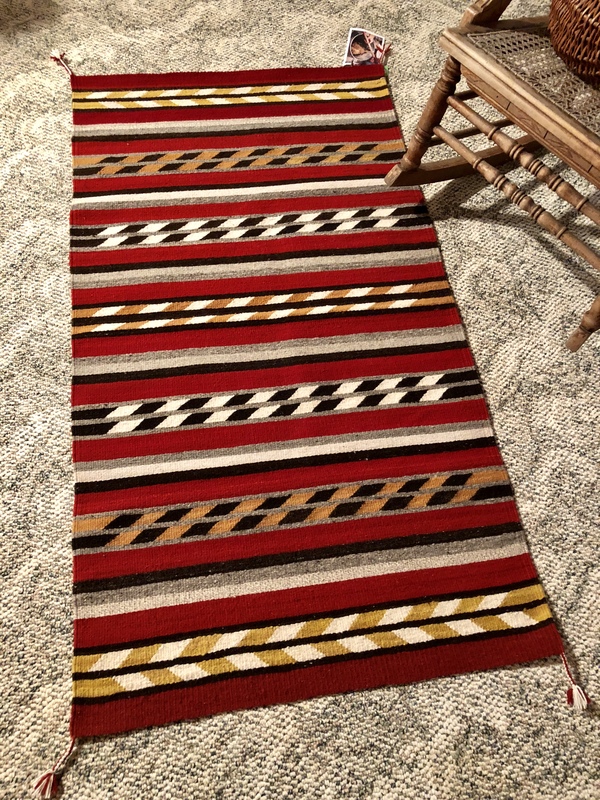 He wanted to show his daughter rug weaving techniques so he went to the house where Dolores and Janet were weaving. Another family from Cancun stepped in to visit and placed a custom order. It was a good day. Tuk-tuk time for me. I hopped into one of those little three wheel red moto-taxis that ply the village lanes and we huffed and puffed over the cobble stones, across the river, onto the dirt and stone road that leads to the hillside where Annie lives. I am entering shiatsu heaven. First a bit of tea and talk, then I’m down on the mat. When I emerge an hour later, magically all my back pain from carrying talavera tile in my backpack is gone. I’m light footed down the hill, gaze at the golden stumps of shorn cornstalks dazzling in the last moments before sunset, stop at El Descanso for a bowl of fresh vegetable soup and agua de pepino con limon, and arrive home just in time to greet Eva Hershaw, a university student applying to graduate school, who came to Oaxaca to create a photo documentary of people who grow traditional maize (the non-bioengineered kind). We had been carrying on a correspondence and I suggested that she first connect with Itanoni, the Oaxaca bakery that only uses native corn. I invited her out to the village telling her that everyone here grows corn just like they did 6,000 years ago. She joined us at the kitchen table as we were finishing late comida, and she met the Chavez family and talked about her project. We will help her connect with local farmers and invited her back to join us for the Las Cuevitas new year celebration on December 31 and January 1. 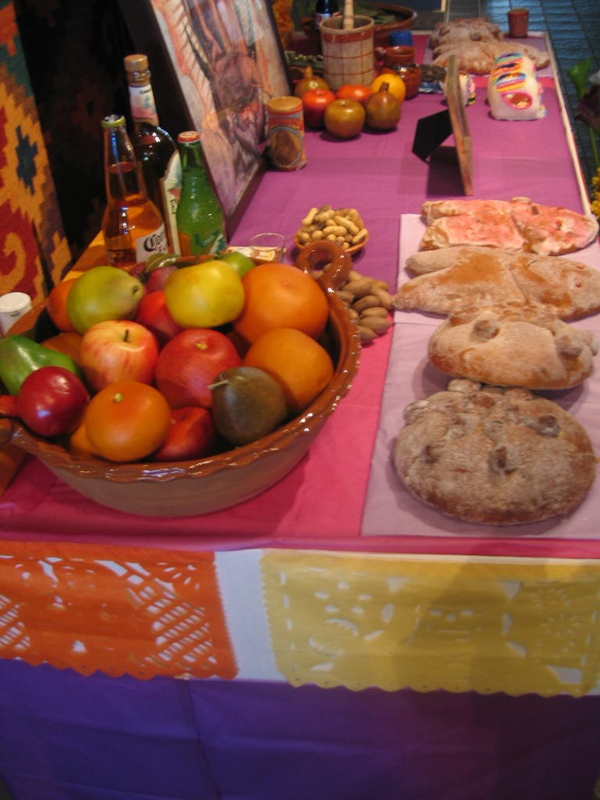 Beginning in pre-Columbian times in the Zapotec culture, the dead are remembered through ofrendas (offerings). Each year the souls of the dead return to earth to partake with the living the foods they enjoyed when they were alive. The ofrenda rests on an altar dedicated to the dead relatives who are only able to return if their path is lit and they can find their way through the underworld. The ofrenda and altar is constructed around the elements of underworld, earth and sky. Here is the interpretation, as told by Eric Chavez Santiago. Level One — Sky: represents religion and the sacred. Level Two — Earth: this is the main part of the altar since it contains most of the characteristics elements including photos of the people remembered, food, fruits and beverages. This area is divided into four equal parts representing the four elements of the earth and the four seasons of the year. Summer is represented by the image of the person remembered, the salt cross, fruits, bread and food, sugar skulls, flowers, and chocolate. A glass of water or mezcal represents spring. Fall is represented with candles, fire, which is necessary to mark the path of light to guide the dead from the underworld to earth. Level Three — Underworld: This the the place where the dead and the souls of purgatory rest. It is the road towards the world of the living where the dead need a guide represented by the candles marking the four cardinal points. This is represented with copal incense to purify the atmosphere, a vase of white flowers to symbolize purity and tenderness, and yellow flowers to symbolize richness, and a small carpet as an offering for rest. The ofrenda that Eric and Janet Chavez Santiago constructed at the University of Notre Dame’s Snite Museum of Art was in honor of their grandfather, Jose Chavez Ruiz, a master weaver who died at the age of 85 in 2006. He took the family design of the caracol (snail) to the next level, achieving a special technique to create a difficult to execute curved design, replicating those carved in the Zapotec temples of 700 AD. The Chavez Santiago family continues to create tapestries in the traditions of their forefathers.